YOUNGSTOWN, OH — Photos of the old Palace Theater are available on my page at Webshots.com. 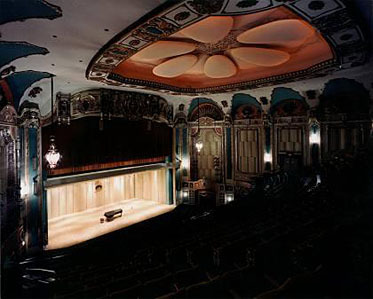 There are also photos of the Powers Auditorium (shown above), along with other old Youngstown theaters. The photos are beautiful especially of the winding staircase off the lobby area! I hope to check out this theatre and the one in Canton Ohio this summer! Guess the Palace doesn’t exist anymore? If so, very sad! The sad part about the Palace Theater is the fact that it was even more beautiful than the B&W photos can show. Right up to the end it was well kept, and could well have been saved. It took the destruction of this theater to spur people to save the Warner. My mother used to work at a candy/deli shop that was next to the Palace. She used to talk how her and the other waitresses would sneak in the adjoining side door and watch all the wonderful shows. It truly is sad that they tore it down. They will never build beautiful theaters like that again.. Very sad. I wish there was a picture of Friedmans Candy/deli shop where my mom worked. would be nice to have since the palace and mom are both gone now. Thank you for the wonderful pictures.